Chris, our host, took us to Bakhawan Eco Park, an eco-tourism project of the local community that spans 170 hectares in Baranggay New Buswang. It’s just a short drive from the town center. There are no jeeps or multicabs that come this way, so best to ride a tricycle. 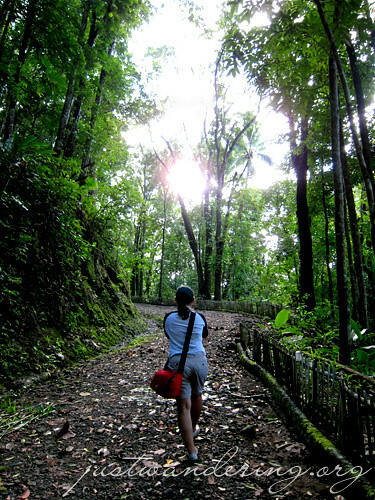 Entrance to the eco park is Php 15 per person, while cottage rental, if needed, costs Php 100. 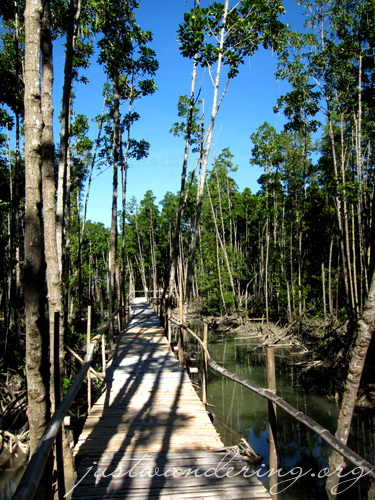 It was an 800 meter stroll on a bamboo walkway raised about 3 to 4 feet off the ground, through the mangrove forest. The bamboo were already showing signs of age, but were still quite stable. You’d have to watch where you step at some point though. It was a pleasant walk, with the trees providing shade and the gentle breeze from the sea cooling you off as you near the end of the path. There are 2 rest stops along the path, with cottages at the end for picnics. Chris tells us that the landscape in the swamp has changed. Typhoon Frank’s path through the Visayas left Kalibo with a terrible mudslide that affected the town for over a week. Most of the mud flowed out to the mangrove forest. Where there used to be a beach and water, now only has mud. Despite the distance of the sea from the cottages, we were still able to appreciate the relative serenity of the place (there were a bunch of teenagers singing Justin Beiber songs in the cottage right next to us). 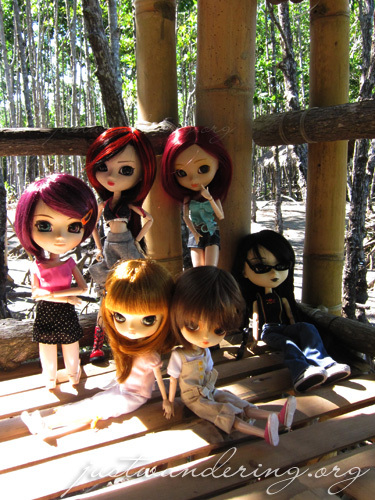 After munching on some ban mi that Chris’ aunt packed for us, we moved on to unpack, pose and take pictures of our dolls. Since it was a weekday, there were hardly anybody in the place — no busy bodies getting in between our lenses and collection. Next in the itinerary was the Aklan State University campus in the town of Banga. It’s approximately 15-minute drive from Kalibo, or one multi-cab ride (just ask the driver to drop you off at the ASU gate). The university lies at the foot of the Manduyog Hill, a pilgrimage site owing to the life-size stations of the cross that line the 750-meter path that winds around the hill all the way to the summit, where there’s a huge cross and a chapel. 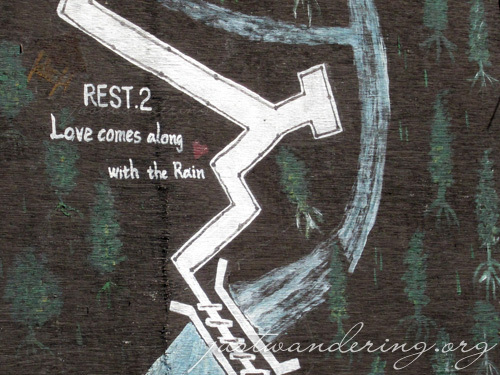 While the path is not paved, it’s an easy enough walk up to the fifth Station of the Cross. Can’t really say if it gets easier or harder beyond that since we decided to walk back to the car. Following the path does have a meditative feel to it — I felt if we weren’t pressed for time, we would have ended up walking all the way to the top. 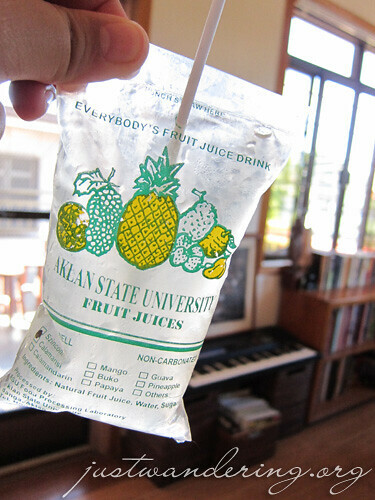 To cool off, Chris had us try ASU’s home grown product: fruit juices. Packed in an unassuming and unimpressive plastic bag, Cla and I were instant converts after the first sip. Coming in flavors like calamansi, calamandarin, szincon, the package boasts that its ingredients only includes natural fruit juices, water and sugar. At only Php 10 per pack, it’s a cheap and healthy way to refresh yourself. We drive next to the town of New Washington, hometown of Jaime Cardinal Sin (RIP) and now home to Sam Butcher, the man behind the Precious Moments brand. An American artist and minister, he fell in love with the Philippines and settled in New Washington, where he built his home and the Sampaguita Gardens Resort that offer accommodations, convention hall and Jojo’s Christmas Cottage — a year-round exhibit and store of Precious Moments goods. There’s a Php 50 fee to enter the complex, but it’s fully consumable. Before heading home, we stopped by the town plaza where the square was lighted up with festive Christmas lights and the air was filled with drumming sounds of groups practising for the Ati-atihan 2011. It’s interesting to see the community come together like this — kids and teenagers involved in the festival, people hanging out with the rest of the town out of doors, instead of cooped in their houses watching soap operas. It’s making me want to consider leaving the city for a quiet life in the province. i love the 1st pic! i’ve been wanting to explore more of Aklan aside frm Boracay ever since, but never got the chance to. Buti ka pa! 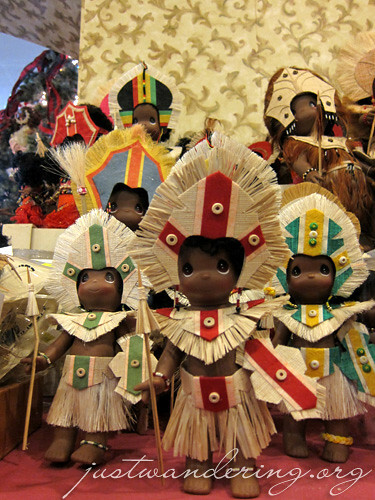 A blogger once told me, if there’s one festival that you gotta see, it’s Ati-atihan! hmmm..kelan kaya yan. Panalo di ba? Punta ka ati-atihan, January 15-16, 2011! I still can’t get over how amazing that Bakhawan landscape can look. 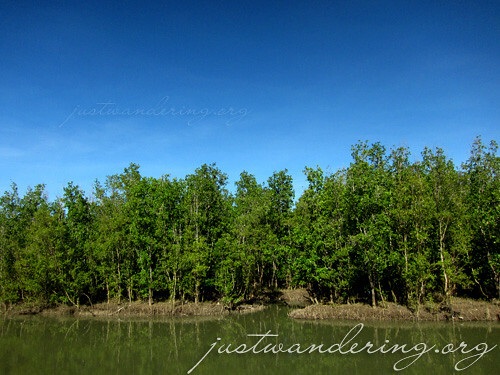 I’ll let you know when they start extending the mangrove trail… sana just in time for the next visit! am amused at the pics of your doll-lings! you actually brought all of them! Merry Christmas Mr. Nomadic Pinoy! Good day. Is there 24 hours public transportation available in Kalibo? We plan to book an overnight stay in Kalibo since our flight is 5:30am (and must be in Kalibo Airport 2 hours earlier around 3am). Can we easily find transportation that early? Thanks. I’m not sure. You can try asking the van driver when you travel from Caticlan to Kalibo. I came across your blog and found your entry very relevant and insightful. With your permission, we would like to publish it on P3. P3 or Progressive Pinoy Perspectives (www.p-3.ph) is a crowd-sourced and curated online news magazine that publishes blog entries featuring perspectives on modern Filipino culture. All articles are written and/or submitted by bloggers and freelance writers in different fields. Our goal is to provide a platform for Filipinos of different walks of life to be able to reach significant awareness and encourage social responsibility among our readers. May we please feature your blog post? If you grant us permission, we promise to cite you as source and to link back to your blog. Thanks for the offer Joseph, but I would rather you didn’t. It’s nice that you featured other sights to see in Kalibo aside from their Ati-atihan festival. great entry!